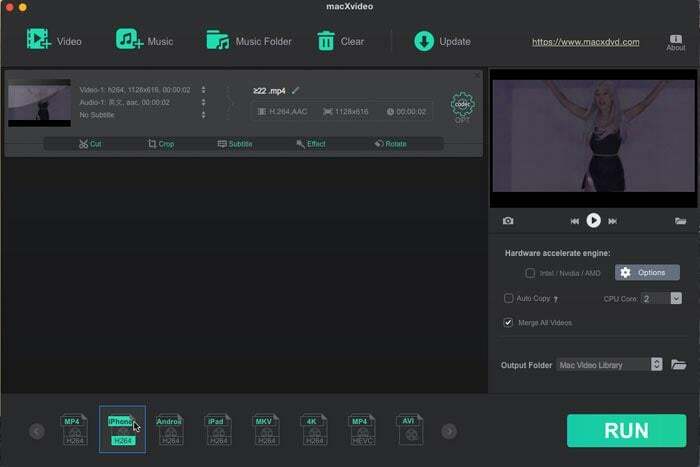 MKV, the video file extension of Matroska Multimedia Container, can store alternate audio tracks, multilingual subtitles as well as rich subtitle data in a single file. It has won a large number of public thanks to its open source. In spite of precious merits it owns, it still has its drawback that it's incompatible with iPhone, iPad, Xbox, PS4 and other portable devices. H264, one of the most commonly used formats for recording and compression of videos, occupies the dominance over most other codecs in delivering much better image quality. And it usually reveals itself with the file extension .MP4, .MOV and .M4V, which can be compatible well with your iPhone, iPad and more stylish devices. In the event that you aspire to play back MKV on your phones, tablets, or Xbox One, for convenient watching on the go, probably converting MKV to H.264 is your option beyond comparison, as H264 has the unparalleled knack of sound compatibility with almost all the fashionable devices, no matter the Apple devices or other video game devices. And thus a reliable MKV video converter for Mac is desperately essential. A 100% free video converter to transcode MKV to HEVC, H.264, MP4, MOV, AVI, and other common formats. macXvideo allows you free compress and convert MKV video files with 98% quality kept, no matter MKV is encoded by H265/HEVC or AVC. Still, this free MKV to H.264 converter is life-long free upgraded to cater for your continuous demands of converting SD video, as well as HD video and 4K/8K UHD video, including MKV to MP4, AVCHD to MOV, WMV to FLV, AVI to MP4, 4K to 1080p, etc. with all common formats supported. Another strong point is that it sports with the advanced multi-core CPU utility to quicken video conversion speed up to 5 times faster than Handbrake, Freemake, clipconverter, etc. This top MKV video converter is a self-contained application, which can accomplish the whole MKV conversion and compression task without any third party apps or plug-ins. So if some anonymous apps or abnormal plug-ins pop up to aks you download and install, just ignore them. Certainly, these cases usually happen to the cracked version on the illegal download sites. As a warm prompt, you'd better download this MKV video converter on its official website. Step 1: Import MKV Files. Free download this free MKV converter and launch it on Mac. Then click "Add File" to load the MKV files which you pine for converting. Step 2: Choose Output Format H.264 as Codec. With this top MKV video converter for Mac, all the profiles are preset for you to easily make a choice. In case you hanker for free converting MKV to H264 with customized output effect, you may adjust the video parameter settings, including resolution, frame rate, bit rate, sample rate, etc with no sweat. Specify output folder on your Mac computer to save the output files by slightly clicking the Folder button. After completing the above steps, click the "RUN" button to begin to convert MKV to H264 on Mac. Tip: Besides, this free MKV video converter is also masterful at making your photo collection become an funny and vivid slideshow in MKV, MP4, MOV, FLV, AVI, and other formats, so as to upload it to YouTube or Facebook or enjoy it on your mobile device on the go. If you are in a hurry to convert MKV to AVI on Mac, MacX Free MKV Video Converter provides you best solution to free convert MKV files to AVI format with ease. Anxious to convert MKV to iTunes? Best iTunes Video Converter comes as the ultimate solution to help you convert MKV to iTunes supported format. Just a few clicks, you can import MKV videos to iTunes for enjoyment. macXvideo provides you with best performance in MKV to H264 conversion with fast speed and no quality loss. It also functions perfectly in MKV to H265, MKV to MP4, MKV to FLV, etc. video conversion on Mac OS X Mountain Lion, Yosemite, El Capitan and macOS Sierra.